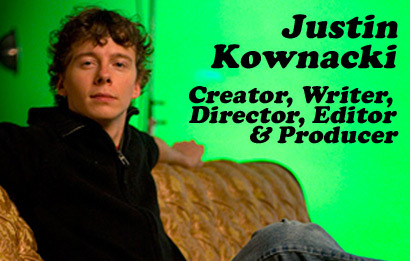 Justin Kownacki is the creator, writer, director, producer and editor of Something to Be Desired. He’s also been the series’ primary cinematographer since Season 2, replacing original cameraman Tom Petropoulos. Although most episodes of STBD involve substantial amounts of improvisation from the cast, Kownacki is the sole editor, which means he spends countless hours deciding which takes, lines and performances best convey the spirit of whatever it was he was trying to say in the first place (but couldn’t be bothered enough to script out fully). He lives in the Greenfield neighborhood of Pittsburgh, where can often be spied walking his cockapoo, Rufus. And no, that’s not a metaphor. You can also follow Justin on Twitter. “The Wingman Cometh” — Rob has a problem with authority. “The Waiting Game” — Rob connives to stay on Dean’s good side. “One Thing Leads to Another” — Rob tries to pick up Dierdre and doesn’t realize he’s failed. “Why Leo Hates Mondays” — Rob hates fat kids. “Rob Sharp Makes a Request” — Rob pitches Todd on a bad idea that just gets worse.